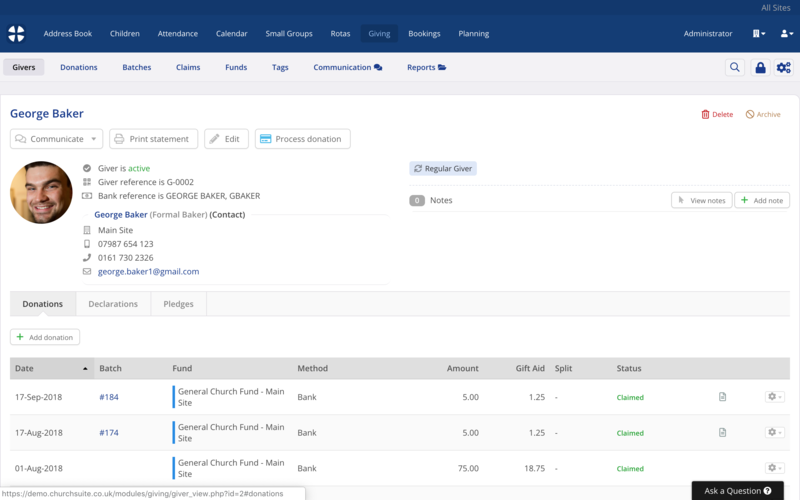 Through the giving profiles of your church members you are able to manage their donations, pledges, and Gift Aid reclaims (UK only) more easily. 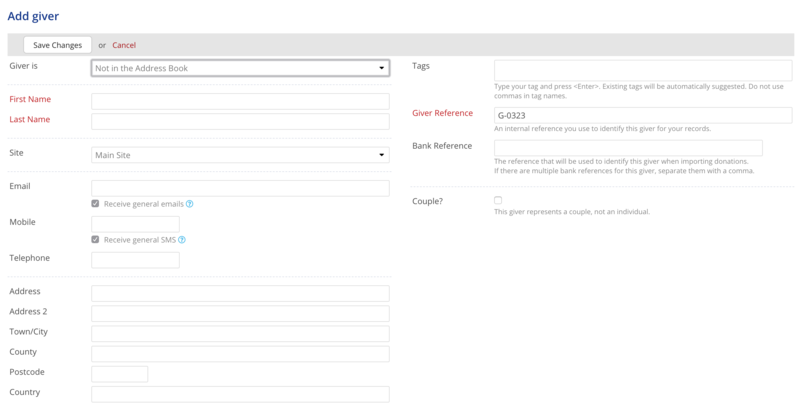 You can also maintain giver profiles for those who give to your church that are not part of your Address Book. Within the Giving module, each of your givers will have their own giver profile. When viewing a giver's profile, you can see the Donations they have made, whether they've signed a Gift Aid Declaration (UK churches) and the giving Pledges they've made. You can also track the progress of pledges. Giver profiles have a status either active or archived. To add a new Giver, go to Givers section of the Giving module and click the Add giver button in the top left corner of the screen. Note also the option in Import givers - this is covered in our related support article. ...or select Not In the Address Book - which will enable you to manually add all the giver's contact information. A giver is required to have a First Name, Last Name. 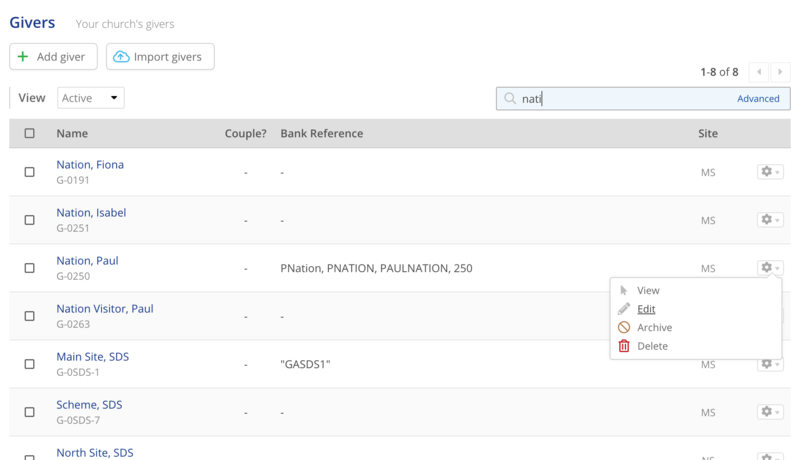 A Giver Reference is automatically assigned by ChurchSuite, or one can be manually specified - perhaps based on your existing internal numbering system. The Giver Reference is required, must be unique, and must also be at least 3 characters in length in order to be searchable. Note: the option to specify whether the giver profile represents a Couple. By default, giver profiles represent an individual. Ticking "Couple?" will display the Spouse/partner details. If the giver profile is Not in the Address Book, the Spouse First Name and Spouse Last Name fields will be empty and can be manually completed. 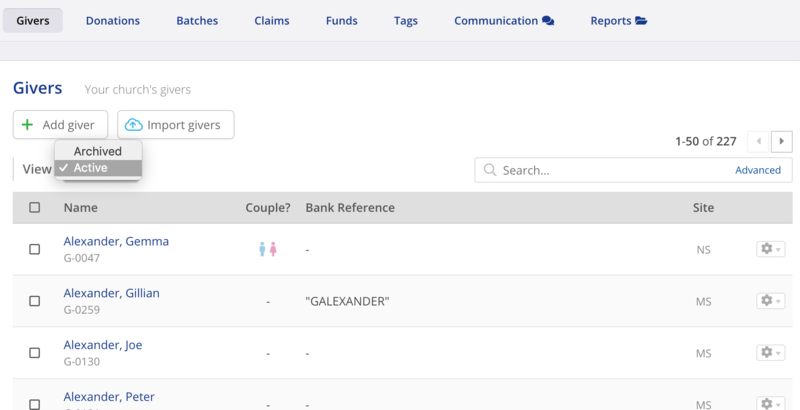 If the giver profile is In the Address Book, the spouse details will only be populated if the underlying Address Book contact has a linked spouse/partner. (see example in image below). For UK churches, you can also optionally specify the Gift Aid Split between the giver and the spouse/partner. When you're happy with the Giver profile information you've entered, click Save Changes before navigating away from the page. The newly-added giver is added to the Givers list. Note the option to switch the View between Active and Archived givers. For multi-site churches, the list of givers if for the site being viewed - if you can find the giver you are looking for, check that you are viewing the correct site or All Sites. You can easily Archive or Delete a giver from the actions menu on the right hand side of each giver in the list. An archived giver can be Set active again. A deleted giver is permanently deleted and cannot be reinstated. Deleting a giver will delete all their historic donations, declarations and pledges. Deleting a giver will only delete the giver profile, but will not delete any underlying linked Address Book contact. Givers with active pledge subscriptions and those with donations included within a Gift Aid claim (UK only) cannot be deleted - consider archiving the giver profile instead. Notice also the options on the giver's profile to add Notes about a giver, to Communicate with the giver being viewed, and the Print statement option to print a single statement of donations for the giver.